SPSP has a longstanding commitment to maintaining the quality and integrity of research findings in social and personality psychology. This commitment is reflected in our ongoing efforts to identify, adopt, and promote best practices through the society’s publications. Here we describe some of SPSP's recent actions as part of its commitment to continually evaluate and adapt strategies to ensure the quality and integrity of research. Initiated and chaired by 2013 SPSP President David Funder, the SPSP Presidential Task Force on Publication and Research Practices (PRP) was charged with making recommendations to the Board of Directors concerning actions to improve the dependability of research findings in personality and social psychology. Concerns about replicability have recently been raised in a wide range of scientific fields including physics, biochemistry, medicine, political science, and cell biology, as well as psychology. As a behavioral science organization SPSP is well-positioned to be a leader in improving research practices and professional communication across disciplines. The hope was that the actions taken by SPSP will be a model for other organizations within and outside of psychology. The committee was particularly requested to consider matters of practice and policy at the society-owned journals, PSPB and PSPR, as well as other issues." The Task Force recommended (and the SPSP Board approved) adoption of a formal Data Sharing Policy and changes to the SPSP submission policies. For both PSPB and PSPR (for empirical papers), these changes included greater transparency in methods reporting (e.g., verbatim wording of all independent and dependent variable instructions, manipulations, and measures, published online for accepted papers) and greater transparency in results reporting (e.g., mandated reporting of effect sizes and 95% confidence intervals, issues of power and sample size). In addition, PSPB guidelines include an explicit statement that replications and meta-analyses are acceptable types of research. See the PSPB Submission Guidelines and PSPR Submission Guidelines for details. Funder, D. C., & Task Force on Publication and Research Practices, Society for Personality and Social Psychology (2014). Notice: PSPB articles by authors with retracted articles at PSPB or other journals: Stapel, Smeesters, and Sanna. Personality and Social Psychology Bulletin, 40, 132–135. 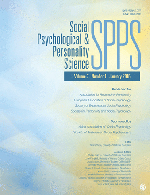 Initiated by 2011 SPSP President Todd Heatherton and chaired by Jennifer Crocker, this Task Force convened a summit among related societies to discuss the promotion of responsible conduct in social and personality psychology. The recent Diederik Stapel case raised many important issues regarding data integrity and professional ethical conduct and put the field under a national spotlight. Rather than having many affected societies work in isolation and have overlap in effort, SPSP felt that a unified approach from the field will be most productive. Accordingly, SPSP convened a summit at the annual SPSP Meeting in San Diego in January 2012 where SPSP members who also serve other societies met to discuss the relevant issues and possible ways for the field to move forward to promote ethical conduct.